About ten days ago, I traveled up to Owen Sound for the funeral of a young colleague who died in a tragic motorcycle accident. During the two-and-a-half hour drive I couldn’t help wondering what life is all about. The stunning reality of the death of someone so young reminds us how very fragile life is. As I drove north the weather began to turn. So, by the time I reached Blue Mountain the wind was really howling. Driving along the shores of Lake Huron I could see waves rising. I’d been driving for over an hour, so I decided to pull over and take a walk before the rain began. Staring out over Nottawasaga Bay toward the vast grey horizon, I felt very small and insignificant. My mind wandered as my face was pelted by the sand that was kicked up by the wind. The sensation of the sand hitting my face awaked me to the reality that we are dust and to dust we shall return. As my mind wandered, I caught sight of a small tuft of tall grass bent over by the force of the wind and sand. The long, tall grass shared my feeling of fragility as it was laid almost parallel to the beach by the strength of the wind. I thought about the Ruach, the wind, breath or Spirit of God, the power and majesty of the Ruach as it blows where it wills. Pelted by the wind, the sand, and the reality of death, the fragility of my own being struck me to my core as a deep, loud, “No!” rose up from my inner being. It was as much a plea to the Ruach as it was a staunch denial of the reality of fragility of life. “NO!” I shouted into the horizon. But the Ruach, the wind and the sand threw my “NO” back in my face as my tears mixed with the rain that began to fall. The wind must have changed direction because when I looked back at the tuft of fragile grass it was standing tall even as the rain’s intensity increased. I took a long, deep, intake of breath. It was as if the very Ruach of God entered my being. I wiped the tears and the rain from my face, straightened my spine and walked back to the car ready to face the reality of our mortality, strengthened by the knowledge that I had encountered MYSTERY; the MYSTERY that is the source of All. The Bible is full of stories that touch the deepest MYSTERY of life. 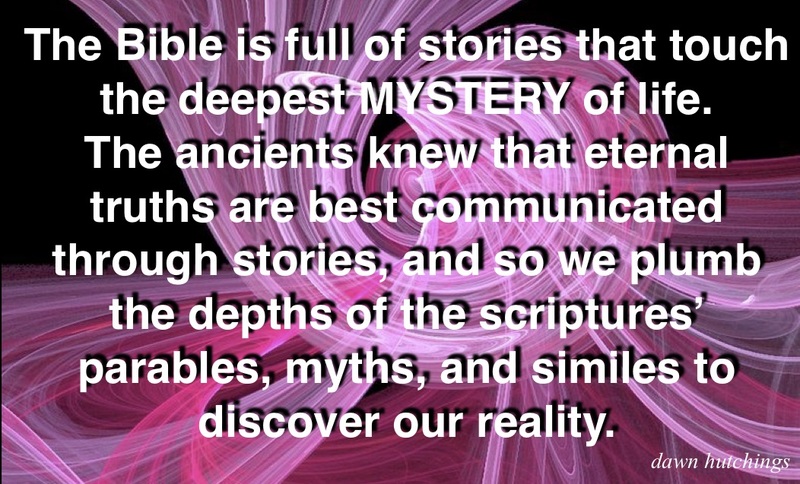 The ancients knew that eternal truths are best communicated through stories, and so we plumb the depths of the scriptures’ parables, myths, and similes to discover our reality. Memories, stories, imaginings, myths, wonderings, and glimpses are the stuff of truth. We human creatures just can’t help wondering. How did we get here? Who made us? Why were we made? Why are we here? Where are we going? We humans can’t seem to help wondering, what’s it all about? From days of old, we’ve been sitting around campfires weaving tales about how we came to be, and what it’s all about; speculating on the nature of our creator. Story after story has been told; stories that weave in and out between our experiences and our wonderings, what’s real, what’s not, what’s true and what are imaginings. The best stories, the ones that captured our imagination and stimulated our wonderings, those stories were told over and over again. Handed down from one generation to the next. Some stories so profound that they just had to be written down. Elevated to the realm of the sacred these wonderings, took on the quality of myth. Sacred truth, so precious that over the years some have sought to defend these stories with their very lives. Others have built their world around these sacred truths, found their identities between the lines of their imaginings. Still others have feared the very wonderings that birthed these sacred truths. So afraid have they become that they’ve tried to insist that these sacred truths aren’t even ours, but rather the divine ramblings of our God. Whispered into the ears of scribes who jotted them down word for word, in the Kings English no less, holding between their lines not only sacred truths, but perfectly preserved history. So treasured are these sacred truths that some even claim that between their lines lie the for-telling of our future. So treasured are these sacred truths that the questioning of even the slightest detail has the power to set one tribe or nation against another. From the storytellers of old to the recesses of our imaginations the character Moses has cast a spell on generations of wanderers and wonderers. All Moses wanted to do was to see God in all God’s glory. Moses who’d been talking with God for years, who’d staked his whole life, and the lives of his kinsfolk, the lives of his people on those conversations, Moses wanted to actually see God, in all God’s glory. Who can blame Moses? Wandering out there in the wilderness, trying to juggle the needs of a people lost and wandering, hoping against hope that there was a land of milk and honey out there somewhere. Moses had the stone tablets; God’s law written in stone a gift for this people who’d followed him out into the wilderness. Imagine: they followed Moses out into the wilderness all because Moses had heard God speak. Right there from out of the flames of a burning bush God called out to Moses. The God of Moses’ ancestors spoke, and a promise was born, the promise of liberation from slavery, of deliverance from oppression, the promise of a land; a good and broad land, a land flowing with milk and honey. Such a promise required more than just the ramblings of a burning bush, such a promise required a name. Who was this god? Moses said to God, “If I come to the Israelites and say to them, ‘The God of your ancestors has sent me to you,’ and they ask me, ‘What is God’s name?’ what shall I say to them?” From that burning bush came the sacred name God said to Moses, “YAHWEH.” I AM WHO I AM. YAHWEH. I SHALL BE WHO I SHALL BE. YAHWEH the sacred name of God, so sacred that Moses and his people would never utter it. So sacred that even after they’d told their stories for generations they’d punctuate the name of God with only a silence; a long pause where people could breathe the name within themselves. So sacred that when it came time to write down the sacred stories, they didn’t write the whole name of God. Just the consonants were enough to evoke the sacred name. The peoples of God, forgot the sacred name. So the scribes replaced the sacred code with bold letter that included consonants and once again the name YAHWEH was heard when the sacred stories were told. YAHWEH, I AM WHO, I AM or I WILL BE WHO I WILL BE. It says it all, God IS. GOD WILL BE. NOW and FOREVER. This ought to be enough. But wouldn’t you like to more? Is it any wonder that Moses asked for just a little more? And so, one day, Moses gave it a whirl: come on, just once show me. “Show me your glory, I pray.” And the MIGHTY ONE said, “I will make all my goodness pass before you, and will proclaim before you the HOLY NAME, and I will be gracious to whom I will be gracious, and I will show mercy on whom I will show mercy. “But,” said the MIGHTY ONE, “you cannot see my face; for no one shall see me and live.” And the MIGHTY ONE continued, “See there is a place by me where you shall stand on the rock; and while my glory passes by I will put you in a cleft of the rock, and I will cover you with my hand until I have passed by; then I will take away my hand, and you shall see my back; but my face shall not be seen.” And so, Moses caught but a glimpse of YAWEH’s backside. Just a glimpse mind you. But isn’t that how it always is. Just a glimpse, a glimpse of God here and there for God WILL BE WHO GOD WILL BE. And we must let the glimpse be enough, but oh those glimpses. When I arrived at the funeral, I was greeted by friends and colleagues as we began the task of preparing ourselves to pay our respects and give thanks for the life of one of our own. In the faces of friends and colleagues I caught glimpses of the ONE WHO IS the source of our being. In their tender embraces I felt the grace and the compassion of our God. Later in the stories we told one another the LOVE that we call God soothed and nurtured us. Sitting around a table breaking bread with one another I felt a deep, heartfelt, “Yes!” rising in me. “YES!” I raised my glass and gave thanks for life. Even though I’m not so sure I’d live to tell the tale, I’d still love to see the face of God. But for now, I’ll settle for a glimpse of God’s backside. For now, all we’ll see is a glimpse of God’s glory. But oh, those glimpses. Once you catch a glimpse you’ll never forget it. So, close your eyes and remember them. I mean it close your eyes. Remember the glimpses. There, look can you see a glimpse of God? There, in the eyes of your beloved. The first time you knew you were in love and there in your beloved eyes, you saw but a glimpse. Or standing there holding that beautiful child for the very first time, gazing into the wonder that you held in your arms, there was but a glimpse. Look down onto the page, between the lines of that poem that told your whole life in just a few lines, there’s the hand of God. Look, look there she goes, she just learned to ride it all by herself, she’s growing up so quickly, do you see right there behind her there in the shadows watching her, if you look closely you see the arms of God ready to catch her. Look at him he thinks he knows it all, there he goes with the keys to your car, in the screech of tires can you hear it, it’s the sound of God trying to catch up with him, trying to keep him safe. Listen carefully can you hear it, it’s ever so faint the rattle of her last breaths makes it hard to hear but if you listen carefully you’ll hear the breath of God breathing alongside her as she breathes her last breath; YAHWEH. And as you struggle to leave the room wondering how you can ever find a way to say good-bye, good-bye Grandma, good-bye Grandpa, good-bye Mom, good-bye Dad, good-bye my love, if you lean back you will feel them, there the arms of God holding you. Look there, God is in that smile, the smile that says I’ve known you so long and yes I still love you even if you drive me nuts, there in the gleam in your lover’s eyes, can you see the glory of God? Gaze out into the field and see there amongst the wildflowers, there dashing by through the trees, trudging up into the hills, hiking over the mountains, if you look closely you’ll see God’s backside. There’s truth in our stories, sacred truth; truth in our myths, in our wonderings, our musings and our longings. Between the lines, beyond the page, in, with, through and under the words, there’s truth in questions and questions in the truth and through it all dances our God. If you open your eyes and look around you’ll catch a glimpse of God; whose backside is more beautiful than words can say. Words may fail us, but we will keep trying to describe the wonder, the beauty, the magnificence of God’s glory. That’s just the kind of creatures we are. So, proclaim God’s glory! Let the God of your imagination, myth and story, take on flesh and dance with your memories of God’s backside. Delight in the knowledge that all our wonderings pale in comparison to God’s splendor. Trust the MYSTERY of the LOVE that we call God. This entry was posted in Adult Education, Bible Study, Evolutionary Christianity, Home, Progressive Theology, SERMONS, STORIES, Theology and tagged emergent theology, evolutionary christianity, Lutheran sermon Exodus 33:12-23, progressive Christian sermon Exodus 33:12-23, progressive christian spirituality, progressive theology, spirituality, theology by Rev. Dawn Hutchings. Bookmark the permalink. Thank you for a wonderful post! It is the glimpses that make life worth living.